What a difference 131 years make. On Wednesday the 21st January 1885, “The Newcastle High School” was formally opened which made Thursday of last week, despite it passing by unmarked, the school’s 131st birthday. Even I forgot. I had remembered it was on the horizon, but, with the actual date not falling on a Wednesday, the daily grind inevitably ensured my mind was focused elsewhere. Red stripes make the new build distinctive at the moment. 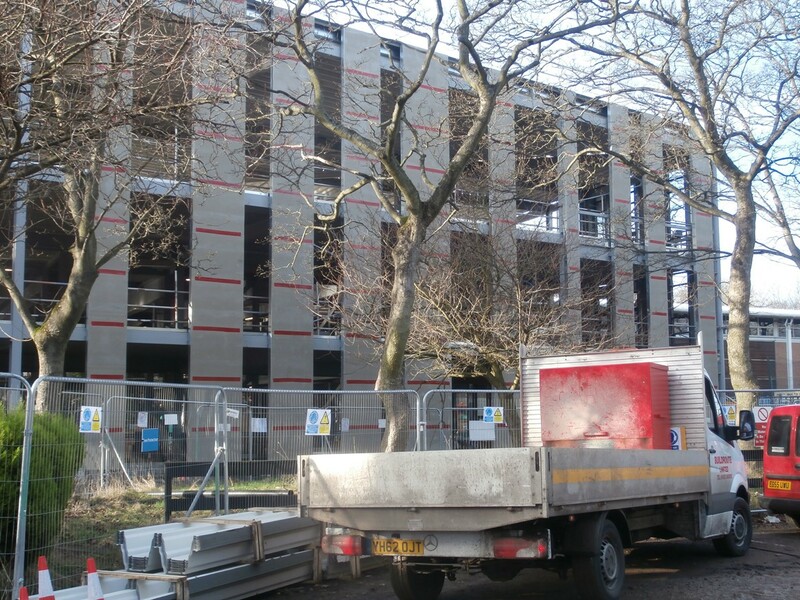 The red stripes on the growing number of concrete board panels on the new build made me smile. Although they will soon be covered over, just for the moment, in my imagination at least, they seemed to be locked in an age-old regional dialogue with the old building where I knew a ‘black-and-white’ builder had mischievously left his ‘mark’. ‘Mischief’ on the top floor of the main building. The very first Tyne-Wear Derby match took place in 1883 just two years prior to the founding of our school. So, even if I wasn’t aware as I’m writing that it’s ‘Derby Day’ today, it seems fitting to mention such a long-established feature of our regional identity in this post. Church High drew its pupils from both Northumberland and Wearside – ‘both sides of the water’ – and NHSG is exactly the same. 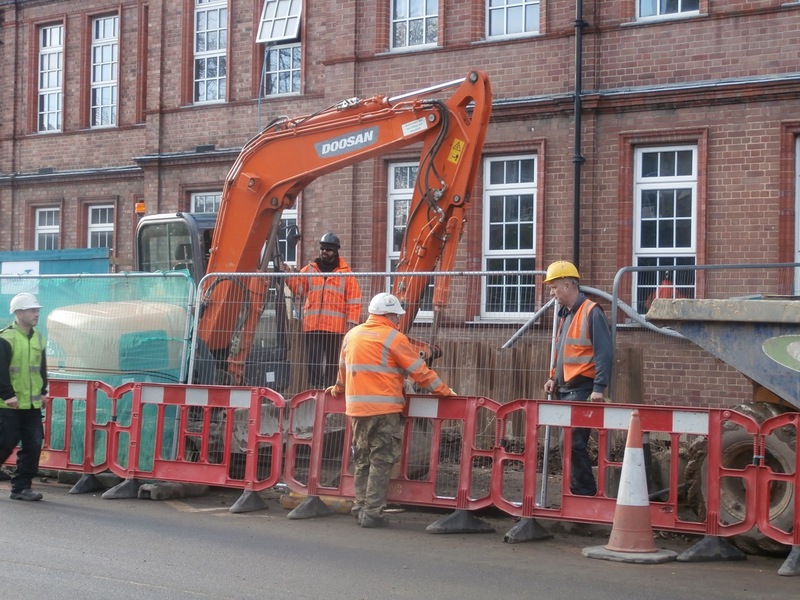 The water & gas mains are now completed. 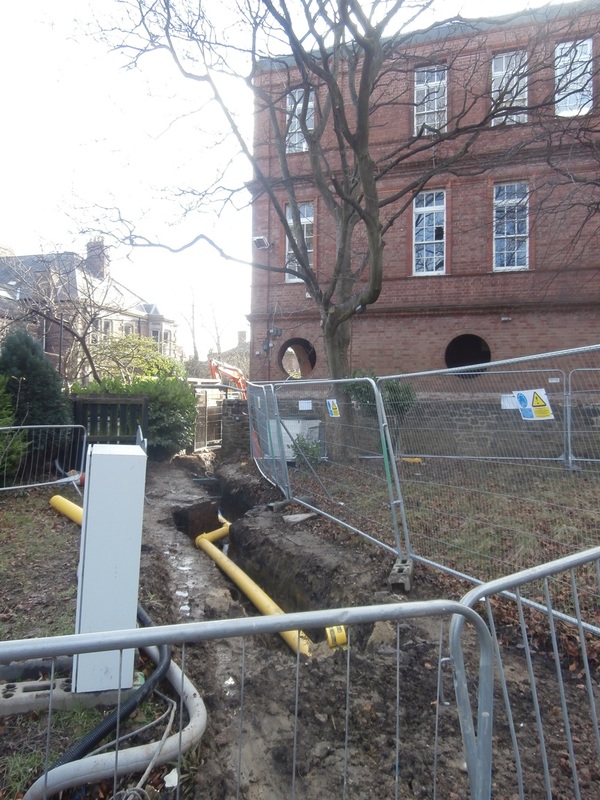 To my left, it was clear the installation of the water and gas mains was now complete as the deep trench was being filled in with earth. 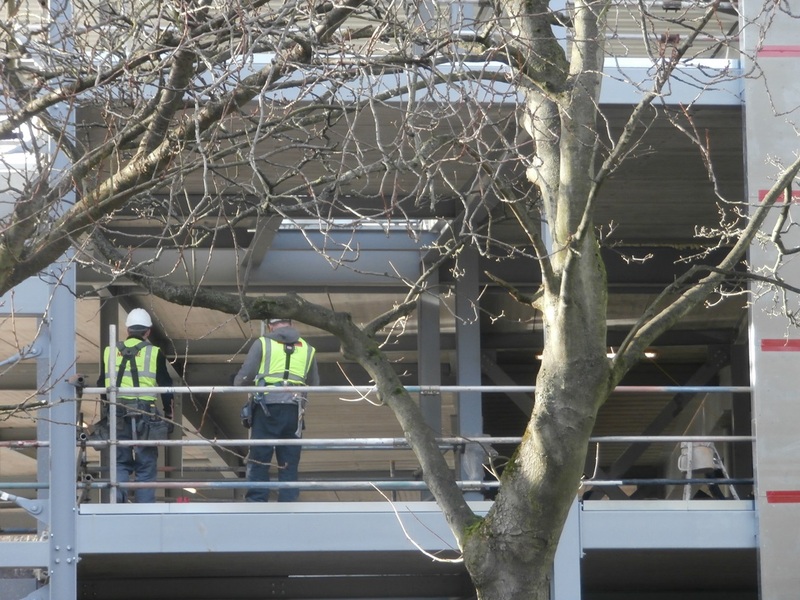 Ahead of me, the height and scale of the new building were made very apparent thanks to the two small figures standing on the roof. 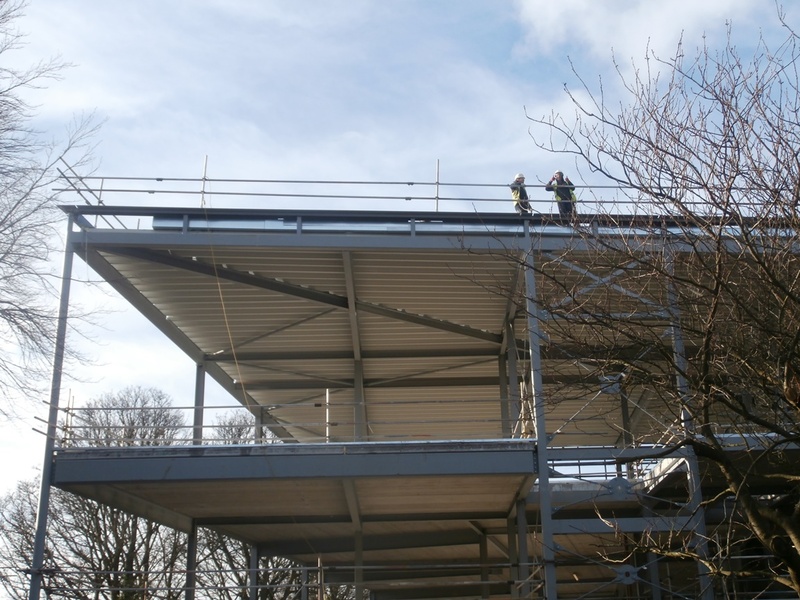 Wates workers on the roof provide scale for the new build. Nearly as long-established as the school, The Wates Group also has a proud 119 year history as an independent family owned company. Edward Wates and his three brothers set it up in 1897, so I think the Tankerville site is in both safe and very appropriate hands. Wates as a company clearly understand family values and ‘The Wates Way’ seems to focus on people and partnership. 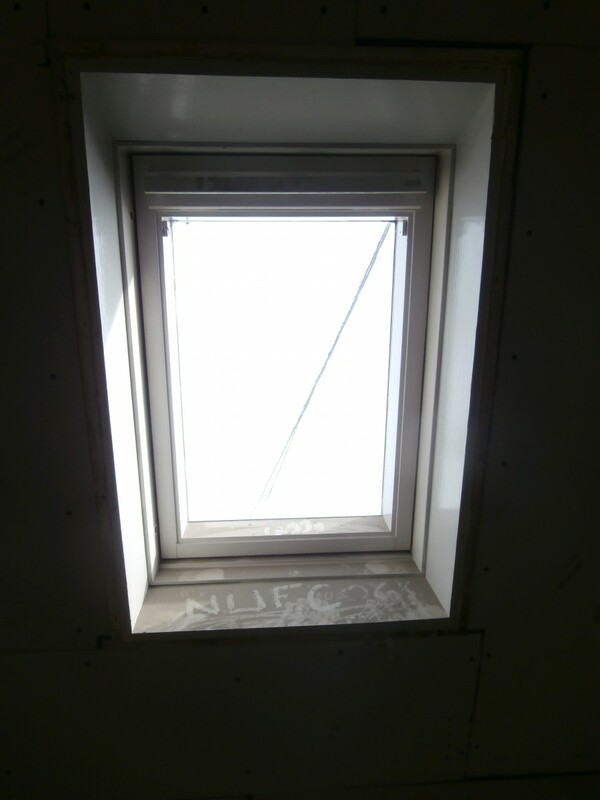 In my dealings with them, I have certainly always found them to be most helpful and very understanding about how much the building they are working on means to us all. And this sense of partnership was very evident on site today. Everyone seemed to be working in pairs! …. 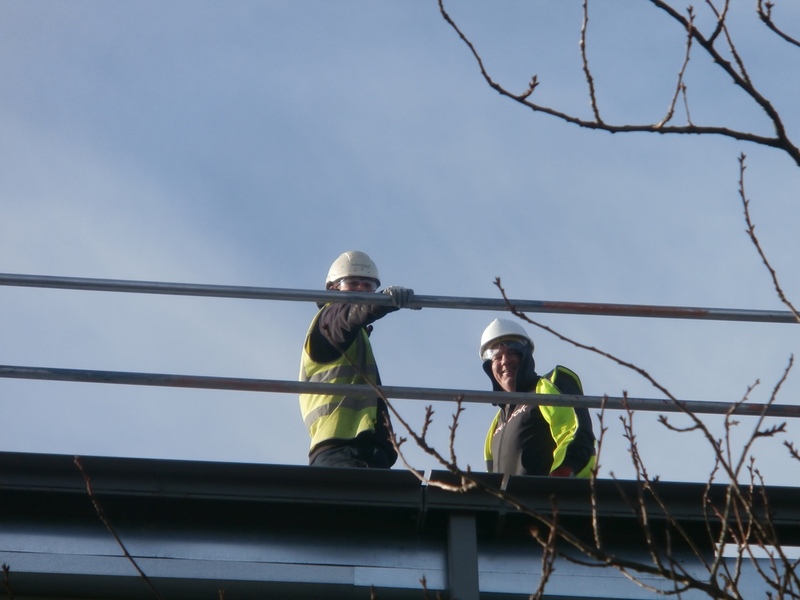 everyone from Wates seemed to be working in pairs. It seems to me that the Wates company vision of ‘Reshaping Tomorrow’ is not too far removed from the vision of any school and particularly a forward-looking school such as ours. Wates’ website proclaims that their company vision ‘builds upon our core values of performance, intelligence, teamwork, integrity and, in particular, respect for people and communities. By delivering it, we will be creating tomorrow’s people, tomorrow’s communities, tomorrow’s environmental footprint, tomorrow’s buildings and tomorrow’s behaviours.’ With a vision as thoughtful as this, I know our building is being held in safe hands. I especially liked the bits of ‘associated’ information in this post, like the curious reference to the ‘mischievous black and white’ builder (it did make you think!) and the mention that it was Derby Day. You are the veritable expert, Christine, on all things to do with Church High. As I’ve said before, your research and application is a full time job.